What Should I Look for in a Knife? When it comes to home cooking, you can’t get very far without a good set of knives. Whether you’re chopping vegetables, carving meat, or slicing bread, you need the right knife for the job. Ideally, the knives will stand up over time and give you years of culinary enjoyment. Though you can buy knives individually, it often makes sense to get a set. Knives are specialized, and in order to prepare food properly you need at least a few different knives to get started. By buying a set, you get a variety of knives for a lower price. 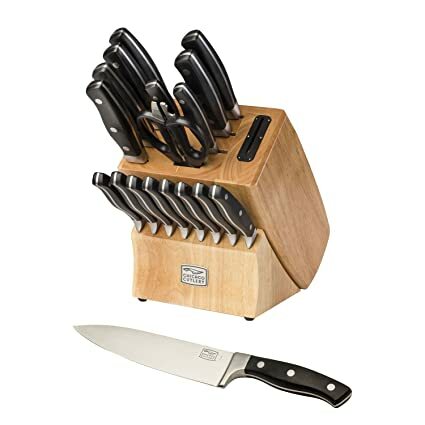 Knife sets often include a knife block as well, so you have a safe place to store your knives and keep them sharp. One of the reasons to purchase a knife set is for the variety. There are some essential pieces to look for in any knife set, along with specialized knives that fit your cooking needs. A chef’s knife. 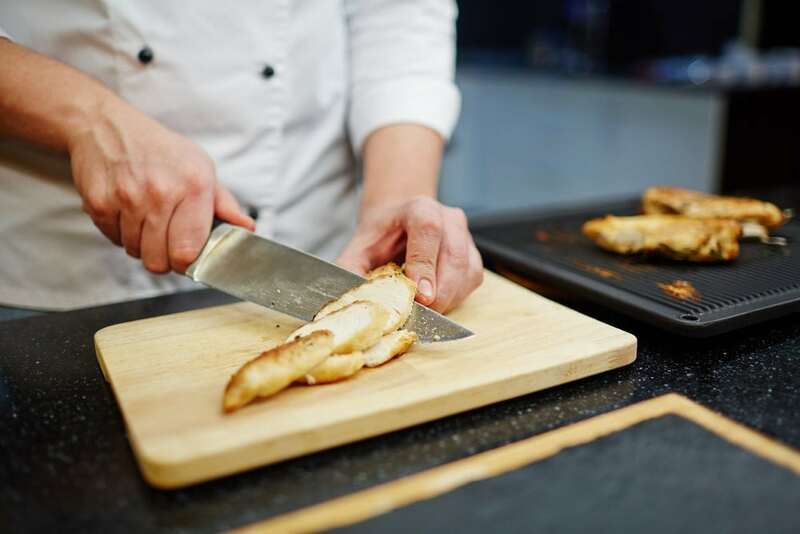 A chef’s knife is the workhorse of any kitchen and can be used for a wide variety of tasks, including chopping, slicing, and dicing. You can also use the wide blade for crushing items like garlic. A chef’s knife is usually about eight inches long and 1.5 inches wide. A paring knife. A paring knife is smaller and thinner than a chef’s knife and is typically used for fine chopping and other precise tasks. Their blades are typically three to four inches long. A serrated knife. A serrated knife has small teeth and works well for slicing bread and other softer items like tomatoes. Unfortunately, serrated knives can’t be sharpened and will need to be replaced if they get dull. A carving knife. Carving knives have long, thin blades and are ideal for carving meat. The blades run anywhere from eight to 16 inches long. A meat cleaver. Meat cleavers have large, rectangular blades and are perfect for chopping up meat. A vegetable cleaver. Similar in shape to a meat cleaver, vegetable cleavers have a straight edge that stays in contact with your vegetables while you chop. A boning knife. A boning knife has a long, thin blade and is able to cut through bone. Blades are typically four to six inches long and are a bit more flexible than other knife blades. A fileting knife. Fileting knives have long, flexible blades and are perfect for fileting fish. Blades range in size from four to 10 inches. A Kiritsuke knife. This Japanese knife is a multi-purpose tool with a straight edge and long blade. A Santoku knife. This is another Japanese knife that rivals a chef’s knife for versatility. Its straight edge makes it perfect for slicing, dicing, and mincing. Kitchen shears. Though not technically a knife, kitchen shears come in handy for a variety of tasks, from opening packaging to chopping herbs. Buying a knife set is an investment. Your knives should fit your style of cooking as well as your overall budget. As you consider different knife sets, there are a few elements to keep in mind. Some knives, and knife sets, can be quite expensive. Depending on the brand, they may be worth the investment. When it comes to knife sets, though, be sure to read the reviews carefully; some manufacturers include second- or third-tier quality knives in knife sets. There are high-quality knife sets out there though. Investing in a set, rather than individual pieces, can give you more value for your money. You also don’t have to spend as much time researching each individual piece. Decide what knives are essential for you and your cooking style. With that in mind, look for a knife set that has those pieces but also fits your budget. Knives are constructed in two different ways: forged and stamped. Forged knives are made from a solid piece of steel. The steel is heated and then cut and beaten into the needed shape. Forged knives are less likely to bend with repeated use and are quite sturdy. They also have a higher price point. Stamped knives are cut by a machine. They have the same thickness through the blade. They tend to be less expensive than forged knives and many perform quite well. They are also lighter weight, so if you have smaller hands or just prefer lighter weight knives, look for ones that are stamped. Knife tang is how far the blade extends into the knife handle. A longer tang provides stability and balance. A short tang could come apart from the handle, creating a safety hazard. Most quality knives have either a full tang, meaning the blade extends the full length of the handle, or a ¾ tang, meaning they extend three-quarters of the way into the handle. The knife you choose should feel comfortable in your hand. Handles come in a variety of materials, including plastic, wood, and metal. Plastic composite and metal handles last the longest. Wood can become soft and rot, so it’s best to go with a plastic or metal handle. Regardless of the material, though, the knife should have an ergonomic handle with a textured or non-slip grip to prevent accidents. Knife weight is subjective. Some prefer heavy knives, while others prefer lighter knives. If you’re uncertain which type of knife you prefer, stop by a store to pick up a few and compare them, or see if you have a friend that will let you “test drive” their knives. With the different metals available today, a lightweight blade can be as durable as a heavier one, so go with what feels right for you. A good knife should be balanced. It shouldn’t have any lean to one side or another, and the blade and handle should balance as well. If the knife is balanced, it will be easier to use safely and precisely. Carbon steel. Carbon steel is very sturdy and strong but less durable than other materials. You also have to stay on top of cleaning and drying a carbon steel blade, otherwise you may end up with rust or stains. Carbon steel knives also sharpen easily. Stainless steel. Stainless steel is also sturdy along with being durable and more resistant to rust. Stainless steel blades are a more of a challenge to sharpen. High-carbon stainless steel. High-carbon stainless steel is more durable than carbon steel and stronger than stainless steel. It’s also relatively easy to sharpen. Ceramic knives are light and sharp, and stay that way for a long time. If they do need sharpening, though, you need to take them to a professional. Dull knives are dangerous. They’re harder to work with and you’re more likely to slip and have an accident with a dull knife. Obviously, your knife should be sharp and stay sharp for a relatively long period of time. All knives will dull over time, though, so be sure to purchase a knife set that includes a knife sharpener, purchase a separate sharpener, or take them to a professional for a tune-up from time to time. Some knives may say they’re dishwasher safe, and that may be true. Dishwashers can cause damage and dings to knives, though. To get the most out of your knives, though, they should be hand washed. As soon as you’re finished using the knife, hand wash it and then dry it immediately to prevent rust and water spots. Sharpen your knives when you notice them becoming dull. Avoid using an electric sharpener, though, as they can take too much metal off of the knife blade. Utilizing a wooden cutting board will also help maintain your knife’s edge. 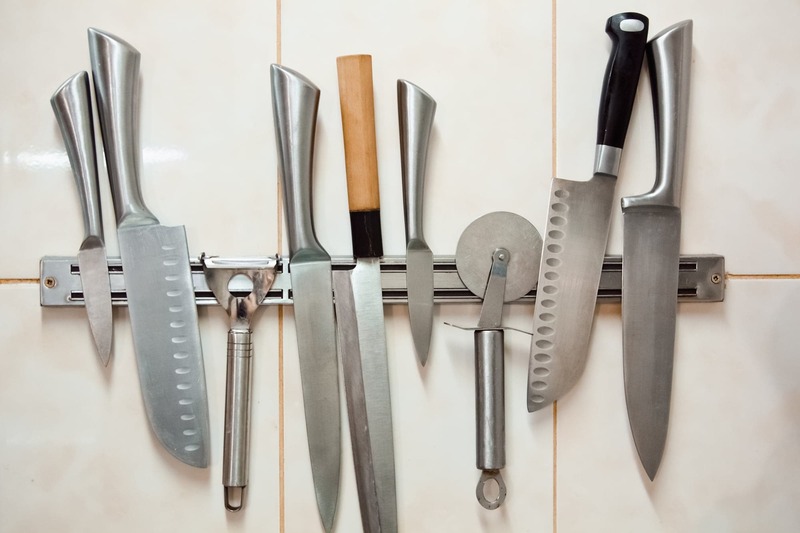 In order to last, knives need to be properly stored, and this doesn’t mean throwing them into a drawer. 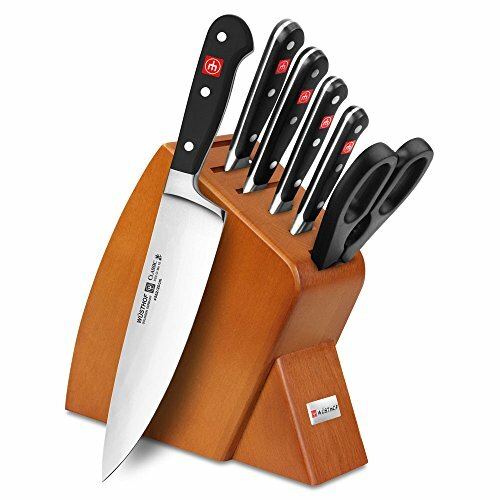 Many knife sets come with a storage block made of wood or stainless steel so you can safely store your knives. You can also utilize a cloth knife roll. Simply place your knives inside and roll it up when you’re not using them. 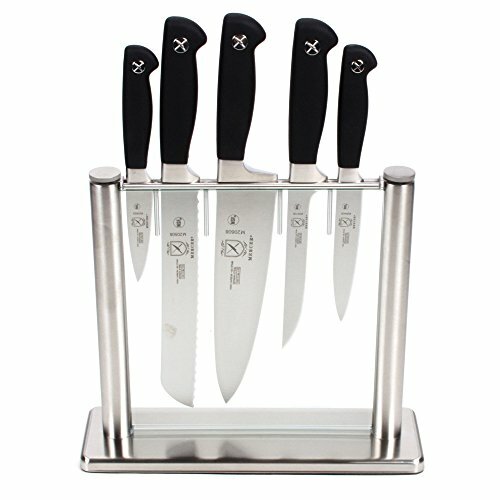 Here are some high-quality knife sets. Whether you’re just starting out in the kitchen or you’re an experienced home chef looking to upgrade, there’s a set that will work for your needs (and your budget). Messermeister is a German knife brand known for its high-quality knives. Each knife in the San Moritz Elité line is forged individually from a single piece of steel that’s heated, molded, and then struck several times by a pneumatic hammer. The blades are made from high-carbon German steel that’s tough, durable, and easily sharpened. 3rd and 4th generation cutlery artisans in Solingen, Germany assemble each knife by hand. Each knife has a ¾ tang, which means the blade extends ¾ of the way into the handle. This gives the knife balance and strength. The handles are ergonomic are made from molded POM, which is a durable thermoplastic. Each blade is hand polished to a 15° edge. The chef’s knife has a wider blade than most, giving you more leverage as you’re cutting in the kitchen. Messermeister was the first knife manufacturer to create knives with a bolsterless heel. This means that you can sharpen the entire blade easily. Messermeister knives come with a “knife for life” guarantee. If there are any material or manufacturing defects, you can return the knives for replacement. The ergonomic handles make them easy to use repeatedly without fatigue. The curved blade on the chef’s knife makes it easy to use for just about any cutting task. There is even a nameplate at the bottom of each knife that you can get personalized with your initials. It’s a bit of a challenge to find a downside to these knives. They are a bit on the heavy side, so if you prefer lightweight cutlery, this may not be the brand for you. The bolsterless heel means there’s a little bit less protection for your fingers as you’re using the knife. With this knife set, you’ll be prepared for any cutting situation you’ll come across in your kitchen. It’s not just a variety of knives; it’s a variety of high-quality knives that are designed to last a lifetime. The blades come quite sharp and can be easily sharpened over time, and the handles are comfortable in the hand to prevent strain and fatigue. The Mercer Genesis knives are forged, meaning they’re made from a single sheet of high-carbon German steel. They’re designed to be durable and resistant to rust and discoloration with proper care. They have a full tang, which means the knife runs through the entire handle, giving the knives balance and weight. They have a bolster to help protect your fingers as you use the knife. Each knife is hand-sharpened to give you a sharp, precise blade. The ergonomic handles are made from Santoprene, a durable thermoplastic. They have a non-slip grip, making your knife easy to use even if it’s wet or if you’re handling greasy, slippery foods. Mercer knives are also NSF certified. The NSF is an independent product testing organization that tests products for quality. They do regular, rigorous testing, and the Mercer Genesis knives have met their standards for quality and safety. The tempered glass knife block makes it easy to find the right knife when you need it. The knives and the block have a contemporary look and feel. Mercer is known for providing cutlery to culinary academies, and the Mercer Genesis knives are designed to bring professional quality knives into the home kitchen. This set is a great value, giving you the essential tools you need without any unnecessary duplication. They also have a one-year warranty. The knife block with the knives inside it stands relatively high, so it’s difficult to take the knives out if it’s under low cabinets. The knives come extremely sharp, so care is needed when you initially use and clean them. They do dull with time, so you may need to invest in a sharpener or take them to a professional from time to time. The grippy handles make the knives a breeze to use for any cutting task in your kitchen. The knife set looks striking in your kitchen, but more importantly, they work beautifully. The knives are balanced and have a good weight to them. The set comes with everything you need for most everyday kitchen tasks. Victorinox is a Swiss manufacturer known for creating the Original Swiss Army Knife. They started as cutlery manufacturers, though, and continue to produce high-quality knives that are also affordable. The knives are stamped, which means they’re cut from cold pieces of steel and do not have a bolster. This makes the knives lighter with a narrower blade. The knife blades are made of high-carbon stainless steel. They have a full tang for balance. Each knife is hand-finished and specially tempered so it can be sharpened easily and repeatedly. The handles are made from fibrox and are designed to be ergonomic and non-slip, even when the handle gets wet. This knife set comes sharp and ready to go. 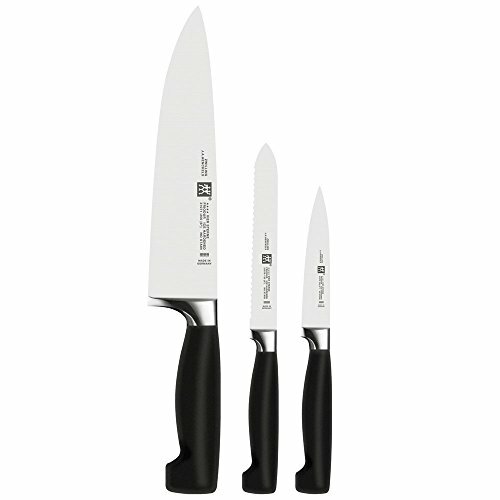 The set itself is a great value, and Victorinox offers a lifetime guarantee on the knives for any manufacturing defect. The knives are also certified by NSF, ensuring they’re high quality. They’re dishwasher safe, although hand washing is recommended. They are designed with minimal crevices, so there’s no place for bacteria to lurk. You can clean them easily and thoroughly so they stay sanitary. These knives are lightweight, and some may prefer the heft and feel of forged knives. The knives don’t have the “look” of more expensive knives due to the plastic handles. 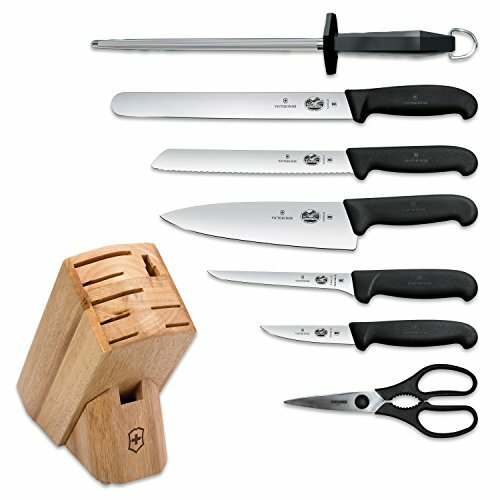 This Victorinox knife set provides high-quality, balanced knives at a great value. The lightweight blades and handles prevent wrist strain. The set includes a sharpener, so you can keep the knives sharp and ready. These reliable knives are perfect for beginning home cooks or more advanced cooks looking to upgrade and enhance their current knife selection. The knives are individually forged from high-carbon stainless steel using their Sigmaforge process. This gives them precision and durability, as well as a cutting blade with lasting sharpness. They also utilize their proprietary Friodur ice-hardening process to build up blade strength and minimize staining and corrosion. The handles are made from bonded polypropylene and are molded for a comfortable grip. They are designed with a full bolster for safety and balance. The blades have a full tang for security and balance. This knife set contains the essentials you need to get started in the kitchen. The knives have a heavy feel and are sturdy enough to last for years. They’re also backed by a full warranty. They are also dishwasher safe, although hand washing is recommended. Unlike other knife sets, this one doesn’t include a block for storage. Some might find the knives a little too heavy if they prefer a lighter blade. Zwilling J.A. Henckels has been making knives for over 280 years, and they know what they’re doing. These three pieces will handle your day-to-day cooking tasks with ease. They’re designed to stay sharp, but they can also be sharpened easily when needed. They’re sturdy, balanced, and have just the right amount of flexibility. Wusthof has been making knives since 1814 and are still family owned today. The knives are forged from high-carbon stainless steel, giving them strength and durability. Each knife has a full tang to ensure proper weight and balance. Wusthof utilizes Precision Edge Technology to create a blade 20% sharper than average that lasts twice as long. Their 14° edge is designed to make cutting simple and easy. Each knife blade is polished by hand to ensure quality. The handles are triple-riveted for safety and are made from polyoxymethylene, a synthetic material that’s designed to be colorfast and stain-resistant. This knife set not only contains the basics; it also includes a Kiritsuke prep knife, which is a multi-purpose Japanese blade with a straight, long blade. The wooden block is small enough to fit into the tiniest of kitchens, leaving you plenty of free room to cook. The knives are designed to last for years, but if you run into any difficulties, Wusthof offers a lifetime warranty. Some have found the block to be of a lower quality than the knife set itself. The logo on the knife is a sticker, which will come off after some use. Everything you need to get started as a home cook is included in this set. The sturdy shears can be used for a variety of prep needs and can even help to open jars. The bread knife cuts through bread easily, and the chef’s knife is perfect for a variety of cutting needs. The forged knife blades are made from high-carbon stainless steel for durability. The knives have a bolster for durability, and the blades are full tang, providing balance and weight. The handles are ergonomic and made from durable polymer. 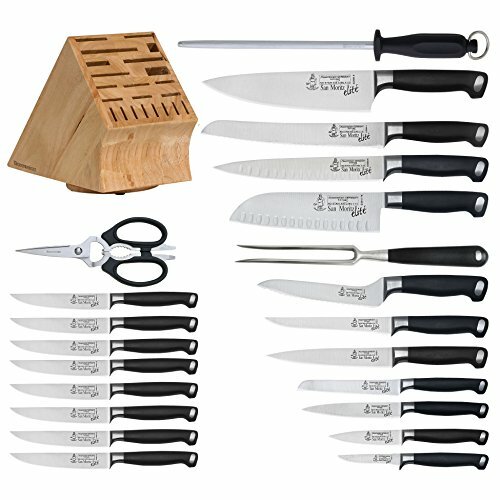 This knife set provides you with all the knives you need at a great price point. The block is sturdy and looks great in any kitchen. The included sharpener makes it easy to keep your knives ready to cut, slice, or dice. The knives are weighty, well balanced, and backed by a limited lifetime warranty. The kitchen shears that are included are extremely sharp, so use caution when you use them. The knives should be hand washed to prevent rusting and will need to be sharpened from time to time, either using the included sharpener or by taking them to a professional. With this knife set, you have a tool for every kind of cutting you might need to do. The Santoku knife is particularly handy for slicing, dicing, and mincing (some find they like it even better than a chef’s knife). With its affordable pricing, this set is perfect if you’re just starting to furnish your kitchen, but the quality makes it perfect for experienced home cooks as well. Here you are some ideas and best practices to choose the right knife set for your needs. 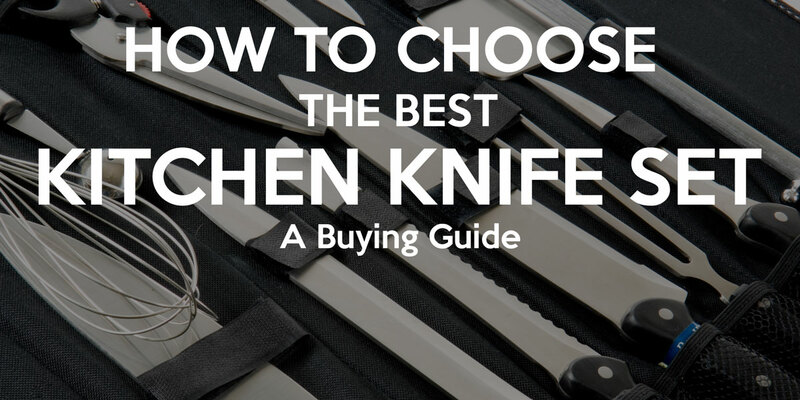 Whether you already own one and are looking for a new, or you are in hunt of the best kitchen knife set, this guide shuold definitely help you in the process. If you have some recommendations or suggestions, please let us know in the comments below – your thoughts are always appreciated!